Pest description and damage Over 400 galls have been identified on oak. 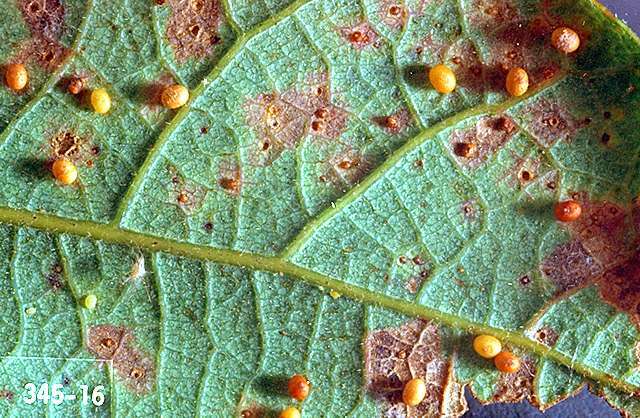 Leaf galls are caused by the feeding of several species of oak gall wasp larvae. Typical galls are enlarged or swollen plant tissues. These may assume several forms, depending on the species of wasp. The main gall wasps on Oregon white oak include Andricus californicus, which forms large, persistent, apple-like galls on twigs; Bassettia ligni, which causes seed-like galls under the bark of branches that often girdle and kill the branch; Besbicus mirabilis, which forms mottled, spherical galls on the underside of leaves; and Neuroterus saltatorius, which forms mustard-seed-like galls on lower leaf surfaces that drop in the fall and jump around like Mexican jumping beans (caused by activity of the enclosed larvae). The California gallfly causes the largest and most conspicuous of the galls on oak, achieving a diameter of 1 to 4 inches. It is a twig gall that is often called an oak apple. It starts out green and in time becomes red on the sunny side. Later in the season, the gall turns brown or greyish just before the adult wasps chew their way out. The gall does no apparent damage to the tree and is removed easily without harming the twig. During its development, the gall may host up to a dozen larvae. Jumping oak galls cause small yellow spots on the upper surface of infested leaves. On the underside of the leaves are tiny seed like galls. These appear in midsummer or later. Inside each gall is the larvae of a tiny wasp. 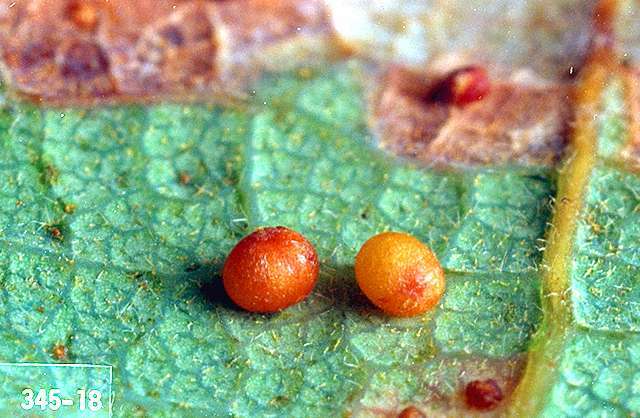 In the fall, the galls drop from the leaves to the ground, where the activity of the larva causes the gall to jump an inch or more off the ground. The wasps overwinter in the galls on the ground. In the spring, emerging females lay eggs in opening oak buds. Adult females emerging from these galls lay eggs on the leaves, producing the larvae which cause the jumping oak galls. Although they may be unsightly, jumping oak galls do relatively little damage. Stem galls are caused by the feeding of any of several species of oak gall wasp larvae. Typical galls are enlarged or swollen. Galls associated with oak stems are often smooth and round, but may be elongate, thorny, or rough. They can be single galls or clusters of galls. Colors vary from green to reddish to brown, depending on the wasp species causing the gall and the age of the gall. .